Some of my favourite recipes were acquired over years of watching my father making the same dishes over and over again. He had a phenominal talent for being able to replicate recipes from his childhood in Spain without a recipe – something I still struggle to achieve! Alright, so this is another soup recipe in the middle of summer – give me a break, I live in Scotland and we don’t have summer!! It is a chunky soup which I find makes it more suitable as a stand alone meal. My husband would argue that this makes it a stew. I however, think a stew is a bit more like a wet one pot meal. It is all about the ratio of broth to substance. 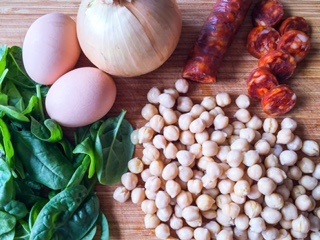 Regardless… if you are using tinned chickpeas and frozen spinach then it can quickly provide a meal in minutes. I would serve this simply with some slices of fresh bread. The chorizo can be optional here – so don’t let its inclusion deter you from making this. Finally, don’t be put off by the egg, it really does finish it off. However, if you are not going to eat the soup right away then I would suggest you keep the egg separate and add it in before reheating the soup and then serving. Heat a little olive oil in a large saucepan over moderate heat, then add in the onion and garlic and cook gently until soft and translucent. At this point I would add in the chorizo (if using), sautéing on both sides until lightly browned. Next add the vegetable/chicken stock, chickpeas, smoked paprika and spinach. Bring to the soup to the boil and reduce to a simmer for a few minutes until the chickpeas have warmed through and the spinash has nicely wilted – about 15 minutes. This may take less or more time depending on whether you have cooked your own chickpeas or used frozen spinach for instance. Cut the eggs in half and remove the yolk from each. Then chop up the white of the egg and add this to the saucepan. Place the yolk in a small bowl or mortar and break it down to a fine crumb with a spoon or pestle. Add a little of the broth from the soup and blend together to form a smooth paste before tipping it into the soup. Stir through and simmer for a few more minutes to warm through and then serve.